What had happened to my baby brother? How did a tiny little pill shatter our family? When did we first begin losing Pat? These are the harrowing questions that plagued Erin Marie Daly after her youngest brother Pat, an OxyContin addict, was found dead of a heroin overdose at the age of twenty. In just a few short years, the powerful prescription painkiller had transformed him from a fun-loving ball of energy to a heroin addict hell-bent on getting his next fix. Yet even as Pat’s addiction destroyed his external life, his internal struggle with opiates was far more heart-wrenching. Erin set out on a painful personal journey, turning a journalistic eye on her brother’s addiction; in the process, she was startled to discover a new twist to the ongoing prescription drug epidemic. That kids are hooked on prescription drugs is nothing new what is new is the rising number of young heroin addicts whose addiction began with pills in suburban bedrooms, and how a generation of young people playing around with today’s increasingly powerful opiods are finding themselves in the frightening grip of heroin. 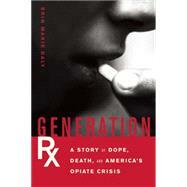 While many books a have tackled the topic of Big Pharma, drug addiction, and our increasingly over-medicated society, Generation Rx offers an entirely new look at what the prescription pill epidemic means for today’s youth and the world around them. Erin Marie Daly was a senior reporter for Law360, a New York City-based legal newswire where she covered the pharmaceutical industry and project liability litigation for the past five years. In 2007, she was nominated for a GLAAD Media Award for Outstanding Digital Journalism. Daly has also reported in country such as India, Bosnia, and Russia. With an MA in cultural reporting and criticism from New York University, her freelance feature writing has appeared in a myriad of publications.